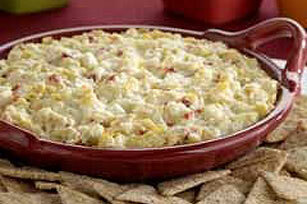 Enjoy flavours of the Mediterranean with this warm and savoury dip. The bold flavours of feta and artichoke hearts stand up tall against crunchy crackers, a natural pairing. Spoon into 9-inch pie plate sprayed with cooking spray. Bake 20 to 25 min. or until heated through. Garnish with chopped tomatoes and sliced green onions just before serving. Substitute a shallow baking dish for the pie plate.